"Dolphins Personal Checks" product is already in your cart. Let your checks show your appreciation for the most glorious sea mammal in the world - dolphins. These amazing and graceful creatures are shown having fun in the sea, swimming below the surface, as well as jumping through the air. Dolphins can hold their breath for up to an hour and actually change 85-90% of the air in their lungs each time they take a breath. Compare that to humans who only exchange 25% with each breath. Dolphins can stay under the water for up to 15 minutes although they usually only stay under water for a few minutes at a time. 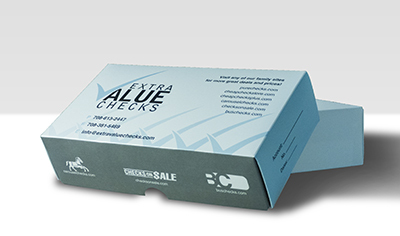 Dolphins Personal Checks are available in single and duplicate check format. Matching address labels and a coordinating checkbook cover are also available.